One of the activities I included in my "Sailing Into the New Year" workshop I ran toward the end of last year included getting rid of excess baggage. I have included some of the information from the workshop in this post. We all have excess baggage, the ideas, self-limiting thoughts, fears, resentments, and feelings that are holding us back. We can be carrying it due to painful, negative, or harmful experiences, and from interactions which cause us to react in a negative way. We can lose sight of what God has in store for us simply because all this baggage is weighing us down. How do we avoid carrying all that excess baggage into the new year? By letting go of what no longer serves us. Take some time to ponder over the excess baggage you have been carting round this year, and in previous years. In the workshop we then wrote a list of things we did not want to bring with us into the new year. Some of the members of the group shared some of things they had written. I also included in this section of the workbook a prayer of release, so we could hand this baggage over to God. 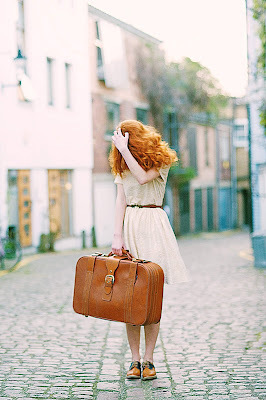 Two of the things I included in my list of excess baggage was worry and over-conscientiousness. You may like to write your own list of 'excess baggage' that you would like to let go of this year. Sherri, I read something similar this morning. I don't think I worry as much as I used to as I am trying to just give problems to the Lord to deal with as I can't do anything about them sometimes. Me too Chel, and I am becoming better at actually remembering to give my problems to the Lord, though sometimes I still find myself tending the weeds in my Victory Garden rather than the seedlings. I am hoping that by having a list of my excess baggage I can be more conscious of the things I want to let go rather than have these habitual reactions (such as over-conscientiousness and worry) remain an unconscious thought that then takes over in the background 'running the show'. I've dealt with a lot of excess baggage in the past, so I know what the major ones, were. While not gone completely, I do require God to remind me where it's creeping back in. So for me, rather than "letting go", it's more about "letting in", trust and acceptance. This is the antidote to any straggling fears. Letting in the good is such an important part of personal growth Chris, thanks for the reminder.